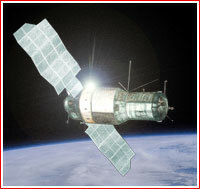 The processing of the first Almaz space station, designated OPS-1 had been completed at the Khrunichev plant by the beginning of 1973, or almost two years after the first Salyut space station, developed at TsKBEM, had been launched. The OPS-1 blasted off into orbit on April 3, 1973. Since the authorities did not want to disclose the existence of two space station projects in the USSR, and particularly, to reveal the development of the military Almaz, the OPS-1 was announced as Salyut-2 upon reaching the orbit. A crew, including the commander Pavel Popovich and flight engineer Yuri Artukhin, prepared to fly to OPS-1 onboard a Soyuz spacecraft, which was originally scheduled for launch 10 days after the station had reached orbit. However, days before the station was ready to go, technical problems with the Soyuz spacecraft forced the postponement of the manned mission. At the time, the processing pesonnel in Baikonur had already completed irreversable operations with the OPS-1 and its rocket booster and the program officials made the decision to proceed with the launch. The station successfully reached its orbit, but 13 days after the launch, ground control detected a loss of pressure onboard OPS-1. The official investigation concluded that as a result of a faulty welding, one of the lines in the station's propulsion system had burst during the engine firing and the plume of the engine burned through its pressurized hull. However, despite all this secrecy and "name game," western observers not only saw plenty of evidence of a failed mission, but almost instantly managed to discern the military nature of the new spacecraft. Unlike its civilian counterparts -- Salyut-1 and Cosmos-557 -- Salyut-2 transmitted signals at 19.944 MHz, the frequency common for Soviet reconnaissance satellites. (34) With their real name secret, the Almaz stations had become known in the West as "military Salyuts."